Riders coping with the first rush hour commute of Metro's massive SafeTrack repair plan Monday morning found themselves dealing with additional delays because of a switch problem and a train with a malfunctioning door. Monday afternoon, Metro leaders felt confident about the way the day progressed despite the issues. They said ridership was only down overall about 1 percent from a typical Monday morning for this time of year. Metro's general manager, Paul Wiedefeld, said riders will only have to deal with major SafeTrack maintenance during the time allotted for work, and nothing more. "We've scheduled this, basically, to get in and do the core of what we need to do in those windows," Wiedefeld said. Metro personnel were assigned at some stations to assist riders in finding their train. But some platforms, particularly the Ballston-MU Station, were more confusing than others, causing riders to miss their trains. "I just missed three trains in the last five minutes," said Metro rider Amy Fleischer. "I don't know where to go right now," said Metro rider Bruce Burns. "I don't see anybody (to help). All I see is passengers and not transportation people." 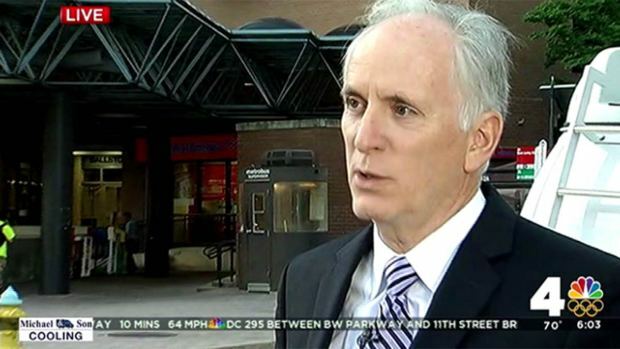 Wiedefeld said more Metro personnel will be at the Ballston-MU Station to help riders. They said stations to the west of Ballston saw 26 percent lower ridership. While many riders early Monday morning reported a slightly slower but still acceptable commute, Metro told Orange and Silver line commuters about 8 a.m. to "expect additional delays" after a switch problem outside the East Falls Church station. After that, delays stacked up for the remainder of rush hour. "Has now been 1hr since I stepped onto Wiehle-Reston East platform," a rider named Allison tweeted. "My train just departed East Falls Church." Those stations are normally about 22 minutes apart. Orange and Silver line riders found packed trains and the option of shuttle buses during the first commute of Metro's new SafeTrack plan. News4's Kristin Wright reports. In addition, an Orange Line train offloaded after several riders reported on Twitter that the train stopped between Dunn-Loring and West Falls Church due to an open door signal. 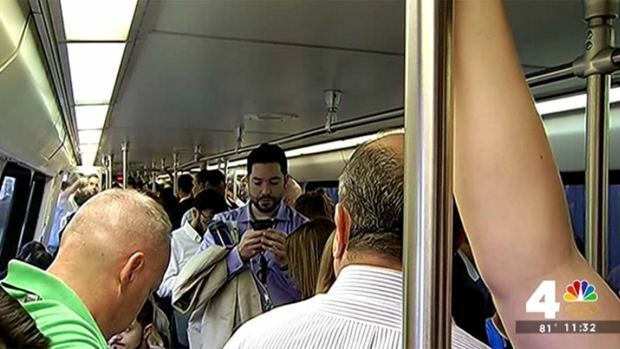 One rider tweeted that the train operator was asking passengers to look for an open door. "THIS is going to be the worst part about #safetracks: regular equipment failure on top of reduced #safetrack work," a Twitter user named Anna wrote. The extra problems had a big effect on a commute for which riders had already been bracing. Before the switch problem, some Metro riders had reported delays and crowded trains Monday morning, while many others said their trips were relatively easy during the first commute of SafeTrack, Metrorail's aggressive, unprecedented overhaul. The plan's impact is expected to ripple across the entire D.C. area over the next year -- but the first big test was Monday. "I'm close to retirement and this could put me over the edge," a rider named Eric said of SafeTrack. Many riders are planning ahead for their first commutes during Metro's massive safety overhaul, said Metro General Manager Paul Wiedefeld. News4's Molette Green reports. Nearly 150 people bought single-trip Capital Bikeshare passes Monday before noon, a spokesman said. More than 260 people took advantage of Capital Bikeshare Corral Service, which lets riders drop off bikes at certain locations even if station docks are full. During the first of Metro's "safety surges," Orange and Silver Line trains are single-tracking for 13 straight days between Ballston and East Falls Church, and running less frequently along much of those lines. Monday morning, many commuters planned ahead. One man said he shifted his work schedule an hour earlier, while another rider, Wayne Klopsenstein, was outside the East Falls Church station shortly before 5:15 a.m.
Klopsenstein said he'd headed out an hour earlier than usual. "I expect long delays," he said. "Not so much crowded trains at this time, perhaps, but definitely the delays." WMATA warned that Orange and Silver line trains may be very crowded, especially during rush hour, and riders should expect significantly longer wait times at multiple stations in Northern Virginia. As expected, some riders expressed frustration. Ana Fernandez said she has no alternative to Metro, calling SafeTrack "poor planning" and "inconsiderate." Alain Sellier said he waited 20 minutes for a Silver Line train. "They could've prevented this by having ongoing maintenance at night like other cities," he said. 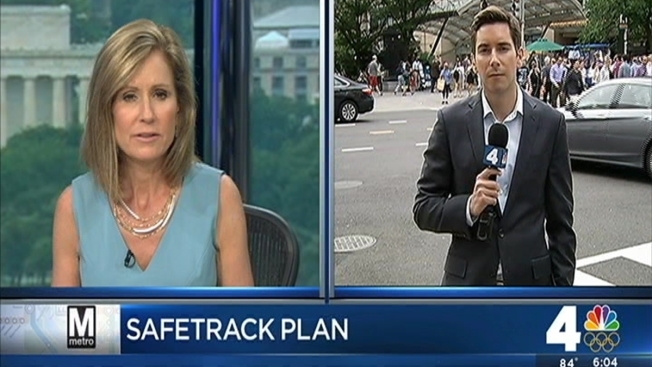 Metro says its 10-month SafeTrack plan is needed to make up for years of maintenance that had been deferred or delayed, and that evening track work simply didn't give it enough time to catch up with the projects. Addy Kennedy said there simply weren't enough buses to handle the demand Monday. "Not enough buses for the 5A from Dulles/[H]erndon," she tweeted. While some riders reported slowdowns and crowded trains, other riders said their commutes weren't that bad. When asked to rate their commutes on a scale of 1 to 10, with 1 being least disruptive, many gave their commutes a 3 or 4. "Just pretty slow," said rider Valerie Ehimhen, who rated her commute a 3. But Sellier, the man who said he'd waited 20 minutes for a Silver Train train, ranked his an 8, much closer to the disruptive end of the scale. Other commuters opted out of Metrorail entirely. "Took 2 buses to work to avoid #SafeTrack delays and got to work in half the time as my normal commute," Cassie Fadeley ‏tweeted. Rob M tweeted, "A busy W&OD trail tells me a ton of people started biking to work today to dodge #SafeTrack." But it didn't work for everyone. Meredith Asbury tweeted that her attempt at avoiding Metrorail by trying to take a bus "resulted in a full bus speeding past us waiting..."
Another 14 safety surges will have major impacts around the region for an entire year. See the entire SafeTrack schedule here. Emmanuel Ayisi, Ellie Hartleb, Dystany Muse and Brooke Wivagg contributed to this report.